The National Highway Traffic Safety Administration recently released its crash data from 2014, which indicated that the two biggest factors in traffic deaths were alcohol and speed (31% and 28% respectively). And the percentage of crash fatalities that involve speeding is higher on minor roads (like our neighborhood streets) than on highways and interstates. Most drivers know that driving under the influence of alcohol is dangerous, but speeding is something that many do on our community streets every day. And they don’t give it a second thought. Most of that speed has to do with street design. Drivers will drive as fast as the road allows. Without physical and psychological signals like trees, parked cars, crosswalks, curves, etc., drivers feel like they can safely drive a lot faster. We already have places that are wide and straight where drivers can drive fast and pedestrians and bikes aren’t allowed — highways and interstates. But our community streets — where cars, bikes and pedestrians mingle so closely — have a lot at stake when speeding is involved. According to Smart Growth America’s Dangerous by Design report, the number of pedestrians who died in motor vehicle crashes between 2003 and 2012 was 16 times greater than the number of people who died from natural disasters during that same period. And the higher the speed, the higher the risk to the pedestrian. The pedestrian risk ranges from study to study, with some indicating that a pedestrian hit by a car going 40 mph has only a 1 in 10 chance of survival. At 20 mph? A 9 in 10 chance. Other studies indicate the fatality risk is 30% at 40 mph and 7% at 30 mph. 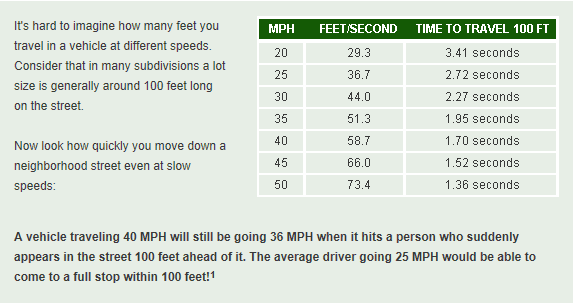 But the bottom line is: the higher the speed, the higher the risk — especially above 30 mph. The risk is amplified when the pedestrian is a child or older person. For example, a 70 year-old hit by a car going 25 mph has the same risk as a 30 year-old who is hit by a car going 35 mph. Why is speed so deadly? Now if that doesn’t give you a clear picture of the relationship between a car and a pedestrian, I don’t know what will. Pit a car against a pedestrian and the pedestrian will always lose. So when we talk about the quality of life for the people in our communities, speed matters. According to the Allstate Best Drivers Report, Rochester drivers rank 152 out of the 200 largest cities in the US. Our drivers are 29% more likely to get in an accident than the national average, equating to an estimated involvement in a collision every 7.7 years. We all think we can stop in time, but we cover a lot of ground when driving. How much? If you are traveling 40 mph, you traverse 100 feet every 1.7 seconds. That means if something pops up 100 feet ahead of you, you will hit it going 36 mph. You need time to recognize a hazard, react and apply your brakes. The distance you need to stop increases with speed. At 40 mph, you need 235 feet to react and stop. At 20 mph? Only 67 feet. The lower the speed, the more reaction time you have as a driver and the less likely you are to cause a crash. And if a crash occurs, it will be less severe at lower speeds (especially if it involves a pedestrian or cyclist). We’ve covered safety. What about the quality of daily life? The legacy of speeding traffic is a daily struggle in the Village (whether you are in or out of a car). It sacrificed the character of the small village and quality of life for its businesses and residents. The Village adopted a Complete Streets resolution in 2011, making walkability the goal for all its streets; and is currently working with the Town on an Active Transportation Plan to make streets safer for all who use them. Calming traffic is the top priority. It is a priority that would be a moot point had the streets not been modified in the 80s. Slower traffic speeds lower public health costs. 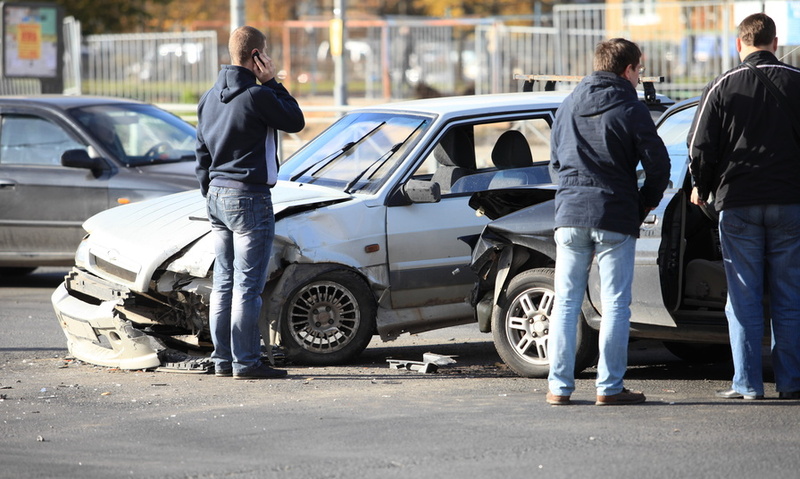 Crashes on roadways cost the US economy over $212B a year. Obesity and other issues associated with our sedentary lifestyles cost New York State billions each year. Slower traffic speeds are better for property values. In Louisville, property values increased significantly along streets that were converted from high speed one-way corridors to calmer two-way streets. Property taxes and business revenues also increased. Traffic speed impacts walkability. And more walkable communities foster social connections that can improve the quality of life and levels of happiness among residents. So, yes, Speed Does Matter. Wondering what’s being done to calm traffic speeds in our local communities? Stay tuned! Next time, we’ll check in with officials from the City of Rochester and local towns & villages to find out! You can also check out our Resources Page to read about Active Transportation Plans and Comprehensive Plans in the Rochester region. Traffic calming is desperately needed on Lake Ave in the Maplewood neighborhood. Even as a driver, following the set speed limit, I have a hard time turning into my driveway for fear of being rear-ended. And trying to cross Lake Ave is taking your life in your own hands, even at a cross walk. 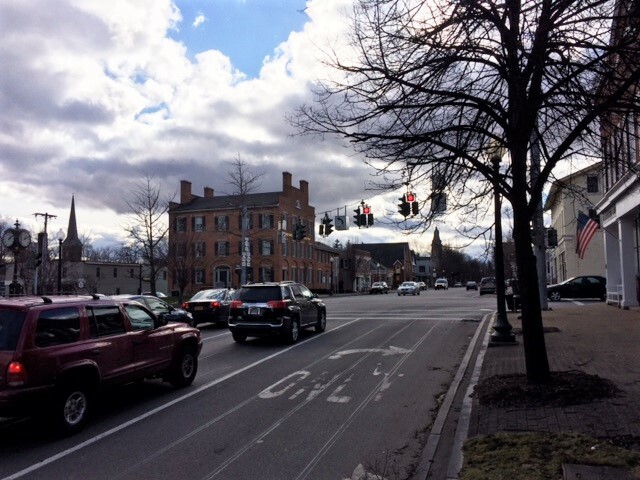 Pittsford is a great example – I remember how much nicer it was before the widening. Brighton has also been hurt by Monroe Ave being so focused on cars rather than people. It’s upsetting that cities, towns, and villages can’t successfully fight the DOT on this. Shortly after we moved to Rochester, the lanes on East Avenue were reduced from 4 to 2 (with turning lanes in some places). It had an immediate and profound impact on the quality of life for our neighborhood. I had to walk my son to preschool on East Avenue and it was amazing how fast traffic would zoom by; no one would ever stop to let us cross and we would get drenched in the winter (and rainy days) because cars were going by so close to the curb. We had no buffer with 4 lanes. With 2 lanes, there were breaks in traffic, drivers were more mindful of letting us cross and it was less confusing for both pedestrians and drivers when a driver did stop to let a pedestrian cross. Plus, that re-design took East Ave back to feeling like the grand avenue it was originally designed as, instead of a busy high-speed commuter road.